Add organization to any area of your home with this portable Art Deco Storage Caddy by Trend Lab. Perfect for dressers and changing stations, this lightly padded caddy has 8 outer pockets and a removable "T" separator for maximum versatility. The body features Paloma gray and white scallop print with burst print lining and mini dot trim and handles. Keep diapers, wipes and other necessities tidy while traveling from room to room. 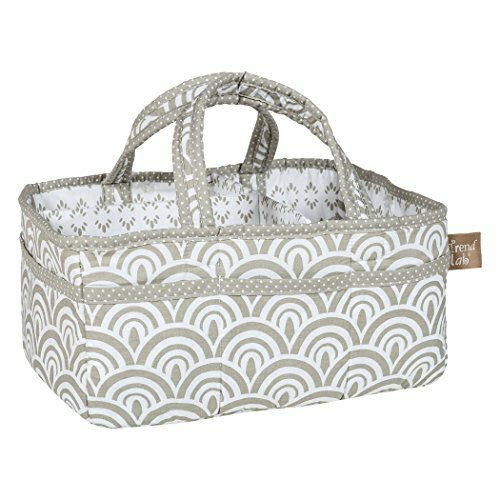 Caddy also functions as an organizer for crafts, picnics, pet supplies, etc. Measures 12 in x 6 in x 8 in. Coordinates with the Art Deco collection by Trend Lab.